This is a treasury of 240 classical and regional Iranian recipes. 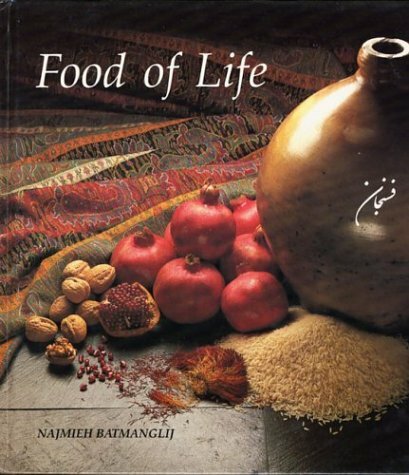 120 colour photographs intertwined with descriptions of ancient and modern ceremonies, poetry, folk tales, travelogue excerpts, and anecdotes make "New Food of Life" not just a collection of recipes but also an introduction to Persian art and culture. Each recipe is presented in a format that is brilliantly logical and marvellously easy-to-follow. You will learn how to cook rice, the jewel of Persian cooking, simply yet deliciously. And by combining it with a little meat, fowl, or fish, vegetables, fruits, and herbs, you'll have a balanced diet - colourful, yet healthy, simple yet exotic.Iranian festivals, ceremonies, and celebrations, together with the menus and recipes associated with them are described in detail: from the ancient winter solstice celebration, Yalda, or the 'sun's birthday', which is the origin of such Western holidays as Christmas and Halloween, to the rituals and symbolism involved in a modern Iranian marriage. Like a magnificent Persian carpet, 1,000 years of Persian literature and art have been woven into the book. Food-related pieces from such classics as the "10th century Book of Kings", and "1,001 Nights" to the miniatures of Mir Mussavar and Aq Mirak, from the poetry of Omar Khayyam to the humour of Mulla Nasruddin are all included. Now with the ingredients for Iranian food available in most US cities, "New Food of Life" makes accessible one of the world's oldest - yet least known - culinary traditions where the first recipes were written 4,000 years ago in a cuneiform script on clay tablets.